Can you determine the equation of a quadratic given its solutions? If you are given the solutions of an equation, you can find an equation by working backward. 1. a. Determine an equation that has the solutions x = -4 and x = 3. 1. b. Find the solutions for the equation 3x2 + 3x - 36 = 0. Working backward will create an equation, but remember that there are other equations that will also have that same set of solutions. x2 + x - 12 = 0. If you have the graph of a parabola, can you determine the equation of the function that created the graph? 1. Given the naked parabolic graph at the right, you are told that the x-intercepts and y-intercept are integer values. Thankfully, the graph shows a scale where each displayed unit on the x and y axes represents one unit. 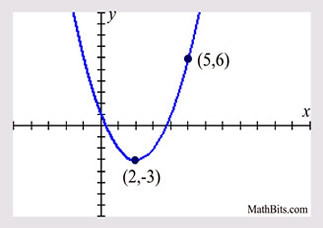 Since we know that the x-intercepts are integer values, we can read them off the graph to be (-3,0) and (4,0). (x - 4) and get the equation y = (x + 3)(x - 4). BUT... do we know for sure that there is no numeric factor in this equation? Could it be, for example, y = 2(x + 3)(x - 4), since this equation also has zeros of x = -3 and x = 4 ? We need to check another point. The only observable point is the y-intercept (0,-12). Since (0,-12) is on this graph, it will satisfy the equation of the graph. y = (x + 3)(x - 4). -12 = (0+ 3)(0 - 4). y = x2 - x - 12 . The zeros obtained from the x-intercepts of a graph can determine the equation of a "family" of graphs. But, ONE MORE POINT is needed to guarantee a specific, individual function's equation. 2. Given the parabolic graph at the right, where it is known that the turning point is (2,-3) and another random point on the graph is (5,6). Write the equation of the function which created the graph. 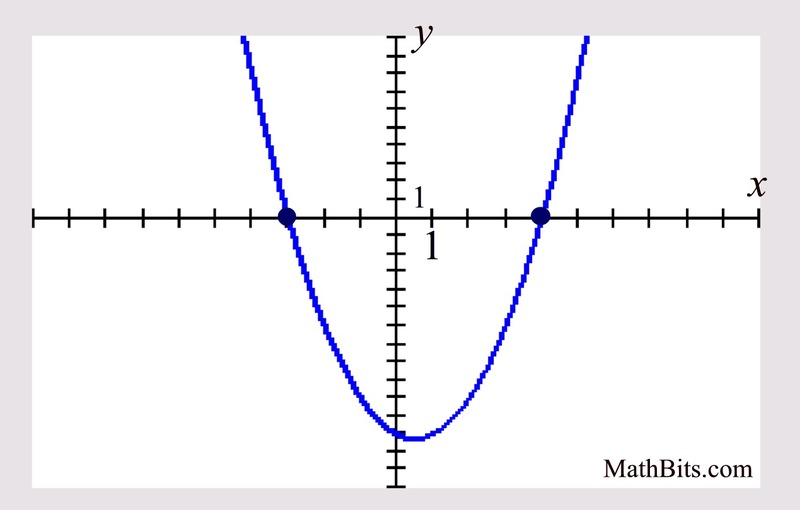 It does not appear that the roots (zeros) of this parabola cross the x-axis at integer values, so the approach we used in the first example will not work here. We will use the vertex form: y = a(x - h)2 + k. We know the vertex is (2,-3) = (h,k), so h = 2 and k = -3. If we substitute, we get y = a(x - 2)2 + (-3). Now, what about "a" ? 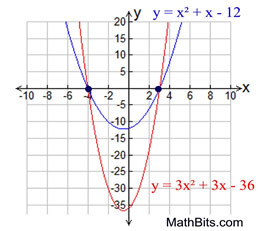 We know that the point (5,6) is on the graph, which means that if we substitute x = 5 into the graph's equation, we will get a y-value of 6. The value for a in this problem is "1". The equation is: y = (x - 2)2 + (-3). You cannot assume that the a-value will always be 1.
that will be discussed in Algebra 2.